The Everest region is famous for trekking, mountaineering, peak climbing and expedition. Among the major destinations of trekking in Nepal, Everest region stood second despite poor accessibility. The number of trekkers to Everest has increased dramatically because of the publicity the mountain has received from several sources. 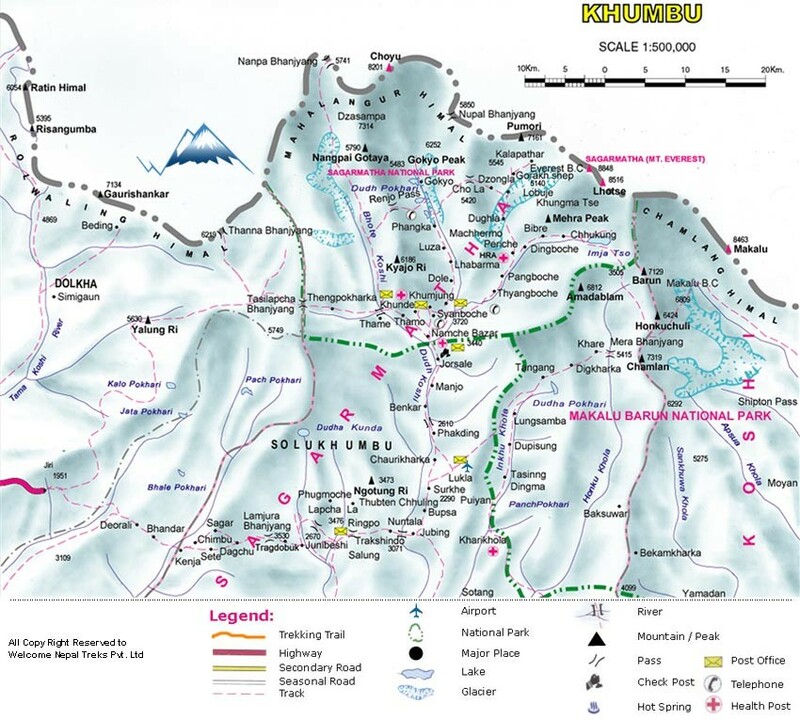 Solu Khumbu is famous not only for its proximity to the world's highest mountain, Mt.Everest (8848m. ), but also for its Sherpa villages and age-old monasteries. Being situated at higher altitude, the region has high risk of Acute Mountain Sickness (AMS) if due emphasis is not given for acclimatization. If symptoms like- headache, loss appetite and vomiting are seen, one has to immediately inform to the guide so that he would facilitate to take first-aid treatment or take you to the near by health post or he will take you down to the lower altitude. This is a classic teahouse trek that passes through high mountain villages inhabited by the Sherpa people, a mountain people of Tibetan heritage who migrated south over the Himalayan chain more than 500 years ago, settling into the high valleys of the Nepal Himalaya. The Sherpas are revered for their incredible strength as local high-altitude alpine climbing guides and are famous for their engaging personalities, kindness and generosity. We would take a breathtaking flight over scenic-mountain passes, to Lukla, a small village at the mouth of the upper Khumbu Valley. After two days of trekking north, we’ll arrive at Namche Bazaar (3440m.) and spend two nights acclimatizing at this relatively high elevation. From this small settlement we trek to a village on the old Tibetan salt route, Thame. Thame monastery would be visited and the next day we’ll travel to Kunde & Khumjung and hike to Phortse. We will travel to Tengboche from Phortse. We would visit the largest Buddhist monastery in the Khumbu, the Tengboche Monastery and return to Lukla. This outstanding trek offers an excellent opportunity to connect us with the Sherpa people of Nepal and become introduced to high altitude life in the Himalaya. Day 05Namche Bazaar to Tyangboche (3867m.) Taking breakfast at Namche Bazaar, we would be heading towards Tyangboche (3867 m.). The trail goes ahead leaving a steep cliff that drops down to the Dudh Kosi. In this section too, we would have a panoramic view of the Himalayas such as Ama Dablam (6812m), Everest, Lhotse, Nuptse (7855m) and Tawoche (6501m). We would visit Trashinga, Phunki Tenga and reach Tyangboche. Tyangboche offers a good view of sun rise and sun set at Everest and Ama Dablam. Day 06Tyangboche to Thame (3750m.) It is our turn to trek from Tyangboche to Thame (3750m.). Thame is located on the old Tibetan trade route. Here one will get a true taste of a Himalayan mountain village. Thame is located beyond the typical tourist treks. Day 07Thame to Monjo (2835m.) Today we trek from Thame to Jorsale. We will pass through the scenic & peaceful valley endowed with rich biodiversity and culture. Overnight stay at Monjo. Day 08Monjo to Lukla (2800m.) Having lunch at Monjo, we trek to Lukla (2800m.). En route, we gradually descend along the bank of Dudh Koshi River. We would have plenty of opportunities to walk over suspension bridges. Day 09Lukla to Kathmandu We board our early flight to Kathmandu from Lukla. Upon arrival at TIA, we would be received by our representatives and transfer to hotel. There are electricity available in some of the villages on our Sherpa Village Trekking where you can re- charges your camera batteries and there is solar power in some villages we trek through and you can recharges your batteries in those places as well if they have enough power and we suggest you to have spare batteries as well and you will have to pay some for recharging batteries. Welcome Nepal Treks organize Sherpa Village Trekking for single people to maximum 15 people at once or even if you have more than 15 people then we can split the group in to two or more groups (according to the number of trekkers) however you all can walk together and stay at same guest house and there are only different guide, and there are 1 guide up to 10 people and 2 guide for 11-15 people and a porter for each 2 trekkers. Else, join our estimated group departure dates available online or ask us with your personal dates, we will open group date on the same date. Sherpa Village Trekking is available on both fixed departure and private basis, If you are looking for a group to join then please check our fixed departures dates and ask for availability or if you would like to travel independently, or with your friends, families & colleagues then you are invited to choose any date like every day at your convenient timeframe for any number of people. Personal expenses depend largely on your habit and as the meals are included on our Sherpa Village Trekking cost ,so, you only need money for table drinks (alcoholic/non alcoholic beverages), snacks while walking (some smaller shops are available along the trail in the areas), tips, souvenirs, hot shower (available in some places), and meals ( A meal cost 5-7USD in Kathmandu) for your Kathmandu stay, entrance fees ( approx: 25USD) while your tour in Kathmandu, if you do not drink alcohol and sopping then 12-15USD per day should be enough for the hot drinks, shower and snacks on trek and Tips are appreciated by your support team after the trek. The amount depends on your budget and appreciation of their work. As a suggestion, we advise you to allocate 10 - 15% of the total tour cost as tips to the staff and you can do this if you feel the services have been good. It's not necessary to spend a lot of money buying equipment for the Sherpa Village Trekking in your country as Majority of these gears can be bought at reasonable rates in Kathmandu. The best time to trek to the Sherpa Village Trekking is spring (March to May) and autumn (September to November). The temperature is moderate in these seasons and guarantees amazing views through the trip. Although this trek can be undertaken during winter, the cold temperature might not be suitable for everyone. In case of a serious sickness or a casualty while you are on Sherpa Village Trekking (which we believe will not happen), we will do everything to transfer you to the nearest hospital to save your life (this has happened to us few times) and you are entirely liable for all the expenses incurred in evacuation/rescue, so, please make sure that these expenses are covered by your insurance policy before assigning for the trek or be prepared to pay on your own after getting back to Kathmandu. Ensure that you’ve insured yourself before doing the trip, Common sense dictates this, it’s good for you and please visit Nepal Travel insurance page for more info about it. You are required to make 30% (non refundable) payment in advance in order to confirm and book Sherpa Village Trekking along with your passport copy and flight detail (Arrival detail, flight name, number and time) and the remaining 80% balance is payable when you arrive in Nepal and you have options of paying the advance by bank transfer or credit card, so, do let us know which modes of payment is convenient for you then we will forward the detail for payment. In addition of Sherpa Village Trekking, we organize extensions both within Nepal and other neighboring countries like Bhutan and Tibet of you have time and want us to arrange your extensions tours, you may do water rafting or a jungle safari, Pokhara tour or Lumbini Tour in Nepal or Bhutan or Tibet tour.